Total acres – 29 acres. Park developed area 20 acres. Path system – 10 – 12 feet wide, lighted, 5000 Linear feet. 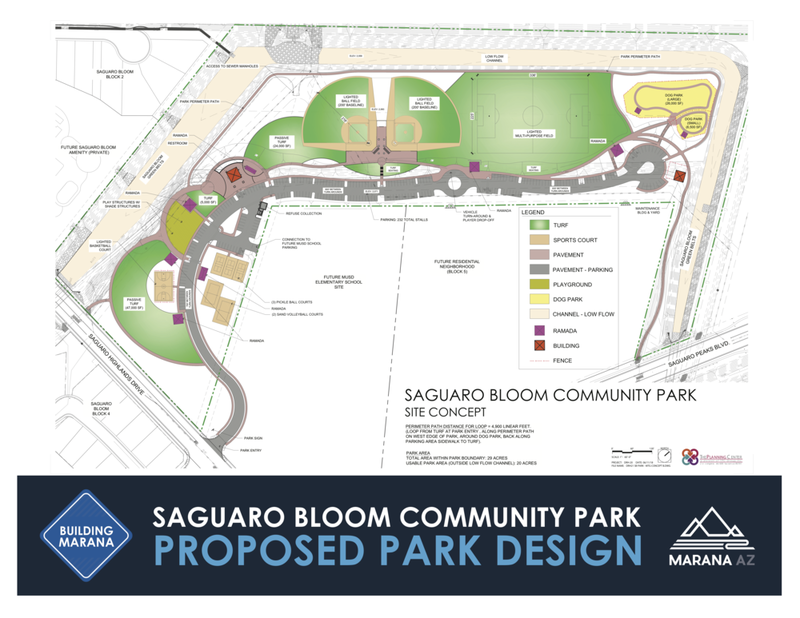 Surrounded by views of the Tucson Mountains and the Saguaro Bloom development, Saguaro Bloom Community Park is the perfect home for residents to play, be active, and enjoy the outdoors. In general, community parks provide active and passive recreation activities and serve as a social and recreational focal point for multiple neighborhoods. Community park amenities often include shade ramadas, picnic tables and benches, walking paths, children’s play areas, multi-purpose/sports fields, a play court, a restroom, and parking. A goal in the design of this particular park is to provide public gathering areas, more lighted ball fields, and amenities that encourage active healthy lifestyles. The design of this community asset and its amenities will be determined through a design process that involves the neighbors and stakeholders. The Town of Marana Parks and Recreation Department is preparing to build a new community park, and we welcome your input. Sign up for the Parks and Recreation e-newsletter.